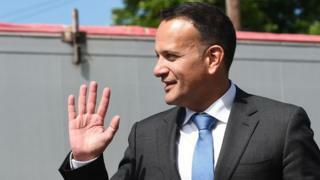 Ireland wants a Brexit withdrawal agreement between the EU and Britain concluded by November "at the latest", Prime Minister (Taoiseach) Leo Varadkar has said. The EU's chief Brexit negotiator, Michel Barnier, gave details of his intent to "de-dramatise" the border backstop issue. The backstop is the arrangement which will apply if the Irish border cannot be kept as frictionless as it is now in the context of a wider deal. The EU has proposed a backstop that would mean NI staying in the customs union and large parts of the single market and the EU VAT system. The UK government has rejected it as a threat to the integrity of the UK. Speaking to reporters on Friday, Mr Varadkar said: "Our objective is to conclude a withdrawal agreement, including an Irish protocol, between now and October or November at the latest." Mr Barnier met MPs earlier this week and his remarks were published on Friday. He said that if a backstop ever had to be implemented goods being moved from and to Northern Ireland from elsewhere in the UK would have to be subject to "controls". He insisted that such controls would not amount to a border and pointed out that there are already checks on some products, such as livestock, coming into Northern Ireland from Great Britain. Mr Barnier said any new checks could take place at ports in Great Britain or on ships and could be "simplified in technological terms". He added he had asked the UK for details of trade flows into Northern Ireland so it would be clear what volume of goods could be involved and how much trade between Great Britain and NI comes via Dublin Port. Mr Barnier said: "What we want is a precise list of the nature, the location of existing controls in Northern Ireland and what volumes are involved." He acknowledged that it would need a joint approach with the UK government if the issue is to be de-dramatised. "This will require an effort on both sides, that we should be able to de-dramatise this backstop by describing what it will mean on the ground." In recent weeks Mr Barnier has suggested the backstop could be "improved" but has given no indication that the EU is open to changing its substance.